Many of us love our "pets" -- our "furbabies" -- and about 90% of "pet owners" consider them to be family members. And many of us have pets, to the tune of about 470 million pets in the USA, which has a human population of about 316 million. 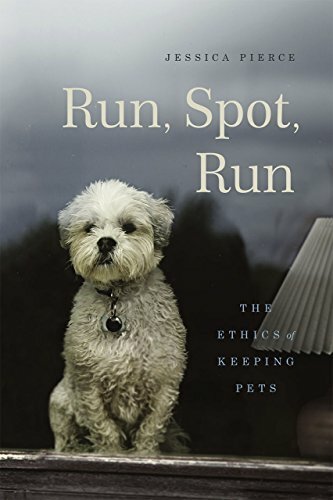 In her book, Run, Spot, Run: The Ethics of Keeping Pets, bioethicist Jessica Pierce opens the readers eyes not only to the sheer number of human-pet relationships, but to the various characters and ethical problems of these relationships. In a society where about half of all pet owners share not only their homes but their beds with pets, we might pat ourselves on the back for being wonderfully loving and caring of our non-human family members. But if we scratch below the surface of this increasingly common narrative, another not so lovely picture emerges. Pierce analyses aspects of human-pet relationships to which many North Americans are blissfully or willfully ignorant, and makes even the most loving and well-intentioned "owner" squirm in discomfort. Her book is very accessible and compelling, and anyone who has pets or is considering "adopting" pets should read it. The scare quotes that I have put around some terms hint at some of the ethical problems that Pierce examines. Pierce runs the gamut from "normal" openly accepted practices, such as spaying or neutering, to not so accepted deviant practices, such as sexual abuse of non-human animals. In an extremely hard to read chapter, Pierce informs the reader that sexual abuse of pets - sometimes fatal -- is more common that many of us realize, and what is most disturbing is the lack of legal protection for the victims. However, it is safe to say that pets in most homes are not subject to this kind of violence, so many of us, while horrified, can look at Fluffy or Spot with loving confidence and believe that we are providing the utmost in care. Or can we? Consider veterinary care. Pierce says the number of cats and dogs who never visit a vet is estimated to be around 25-50%, and no doubt that number sky-rockets for other kinds of species, such as rodents, reptiles, and fish. Many pet owners consider veterinary care a luxury and pets are often euthanized in lieu of costly treatment. I have witnessed this myself. In my younger years, I was interested in becoming a vet so worked in a couple of clinics. One factor that changed my mind was the prevalence of humans choosing not to spend money on therapeutic and sometimes curative treatments. Of course, some people simply do not have the money, but Pierce is right in that many simply don't make vet care a priority. Some spend hundreds, even thousands, on pet accessories, and presumably unnecessary human accessories, while denying veterinary care to alleviate suffering or prevent death for their beloved furbabies. One disturbing memory I have is of a woman who refused to spend "that kind of money" on her cat, while also owning a pure-bred Boxer. She said she might spend such money on the dog, since he cost a lot to purchase in the first place. Many people refuse the cost of vet care but not that of some material item, or trip, restaurant meal or whatever. Pierce paints a picture of the person who stops off to make such a purchase to console himself after euthanizing his beloved family member because he couldn't afford the necessary medical treatment. While we might give lots of affection, food, water, and even veterinary care to our pets, there is an area where we might nevertheless be neglecting them. Many pets suffer from boredom because they don't have the opportunity to express their highly evolved behaviours such as hunting, running, mating, scratching, or socializing with others of the same kind. The picture is bleakest for those kept in aquariums, terrariums and cages. Pierce argues that with enough knowledge, empathy and effort, we can likely meet the mental, physical, emotional and social needs of the animal companions that have co-evolved with humans -- namely dogs and cats. However, we can never provide ocean-like environments for marine animals, sky-like environments for birds, and the kind of running, slithering, hunting or hiding opportunities that non-captive reptiles experience. Another problem with keeping pets, other than dogs or cats, is the question of intersubjective engagement. Tiny animals that perceive us as predators might learn to be still and tolerate our presence and even handling, but what are they getting out of the experience? Do they enjoy it? Can we relate to one another on an emotional level, where positive affect is a two-way street? What is life like in a fish-bowl? Pierce draws on empirical research in cognition to show that even the "lesser" amongst us have cognitive capacities that cannot be satisfied in impoverished environments. Stereotypical behaviours such as pacing, rocking, or swimming in circles are evidence of boredom, anxiety and other forms of mental stress. So if we insist on confining "pocket-pets", fish or reptiles, in our homes, then empathy requires that we learn how to enrich their environments so that they don't die of boredom and loneliness (most having much lower life expectancy than their wild counterparts). Unwanted and discarded pets are a problem of which many of us are indeed aware, but we like to believe that shelter systems deal with such surpluses in a humane and responsible fashion, finding loving homes for those who are home-able. Pierce reveals the ugly truth that every 11 seconds, a healthy dog or cat is killed in US shelters. Further, there is little to no regulation of shelters, and workers who euthanize animals require little to no training to do so. In her analysis of language involving non-human animals, Pierce criticizes the use of "euthanasia" for these killings and suggests reserving the term for those cases where we help our loved one ease into imminent death. What is at bottom of the suffering, neglect and abuse that humans inflict knowingly and unknowingly on animal companions? Pierce argues that the multi-billion dollar pet-industry and lobbying organizations carry much of the blame for the encultured objectification of companion animals. The pet animal trade, from breeding to pet-food and pet accessories, raked in 50.8 billion dollars in 2011. Marketers and lobbyists have vested interests in exploiting human capacities and desires to attach to non-human animals, and in promoting our "rights" to keep them as property and do with them what we please. So what is the answer? The fact is that many of us really do love animal companions (the term Pierce favours over "pets") and many human and non-human animal lives are richer for the loving relationships. Pierce recommends several incremental, feasible changes that would offer better protection. Many of us might see these changes as long overdue and wonder how such a shocking lack of protection can coexist in societies where animal companions are family. Pierce shows us how they coexist, and shines light on commonly accepted practices such as caging a dog alone all day while her "owners" are at work, only to be released at the owner's convenience. It seems in these cases that the agency of the dog only exists in relation to the human. Pierce compellingly argues that it is high time to see animals as "who" instead of "it", and that we learn to understand, accept, respect and value the agency of the animals whom we claim to love. Ring is a PhD candidate in Philosophy at York University in Toronto, Canada.